Newcastle 0-0 Arsenal – Move. Run. Sports. After last seasons thrilling 4-4 draw and the greatest comeback in Premier League history, this game was bound to be a disappointment. Chosen for ESPN TV coverage making our opening day of the season a 5:30pm kick off. Possibly a reason the edge was taken off the game? Well it is never the same when a game does not kick off at 3pm on a Saturday, just a totally different edge surrounding the game. However, opening game of the season and I was excited and very optimistic. Until of course the first 20 minutes of the game when even in that early stage it looked like both teams were happy playing for a draw. Both clubs in slight turmoil with more players leaving than any hope of players coming back in. Nevertheless the fans turned up to support them, plenty of away support for Arsenal. 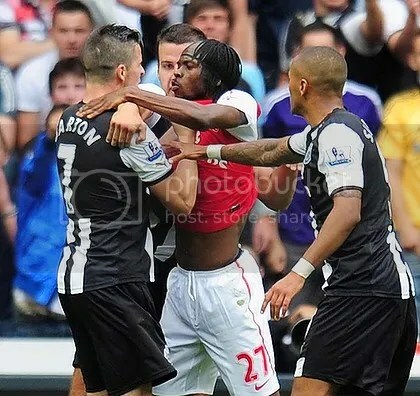 A not very memorable game of football which had one major talking point, the scuffle between Joey Barton and Gervinho. Which lead to a red card for Gervinho after he slapped Joey in the face, who then made the most of it by flinging himself to the floor. This was after Joey had dragged him up by his shirt. Joey picked himself up a yellow card for it all. This was not the only controversal moment that Joey was involved in, he was actually stamped on by Alex Song earlier in the game. Who has been charged with violent conduct today! Not something we ever want to see in football, the same with the Barton/Gervinho situation. Steven Taylor was also brought into it by been shown on TV highlights telling the ref that Barton had been elbowed in the face. Let’s just face it no one else should have got involved. We now just have to hope that this will not happen again for us this season. Performance wise – getting back to the football! We have to take positives from the introduction at half time of Gabriel Obertan who give Arsenal some problems with his pace and actually looked threatening. He replaced Demba Ba who had a debut to forget, even more so with the fans saying it was like having two Shola’s up front – or at least the people I sit around. Ba spent more time on the ground than he did on his feet. We must see a big improvement in him and fast! The other position which was looked at with great curiosity was left back, with Enrique’s departure the day before. It was filled by Ryan Taylor (who I am no fan of at all) but I pleased to say that he put in a solid performance, with some well timed and important tackles. A first look at Yohan Cabaye in the Premier League was decent, but playing your first game against Arsenal would always be tough and it was obvious that he tired very quickly and looked a little off the pace. I am sure that is something that will not take him very long to get over and he will be a good signing for us. The introduction of Obertan at half time saw our formation change from 442 to more of a 451.